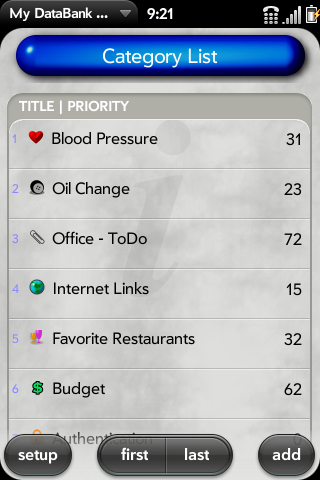 My DataBank is a simple yet powerful and customizable database application for webOS that can be used for general data storage on just about any information. This includes medical and health related data, vehicle maintenance logs, internet bookmarks, restaurant reviews, measurement reminders, authentication credentials, home and office to-do lists, billing and budget records, GPS locations, as any other information you prefer to customize. New features now include Image viewing support for JPG, PNG, and GIF formats. Group multiple e-mail recipients and send e-Mail blast feature. Share and download free Categories from around the world. Group and launch multiple Web Browsers instantly to view all your favorite websites. * Up to 5 text, integer, date, and boolean data types. * Multiple categories and items. * Primary and Secondary field sorting. * Data Export and Import. * Acquires current GPS latitude and longitude coordinates. * Frequency logging and Priority sorting. * Choose phone numbers and eMails from your Contacts app. * Choose filename locations for your Photos/Music/Video/Documents locally on your webOS smartphone. * Generate and eMail your Items as a datasheet Report. * Delete or Export all Items for any specific Category in the database. * Send an SMS message to all recipients for any specific Category. * Supports basic formula calculations against field values. * Supports basic conditional comparison logic against field values. * Supports query filtering logic against Item lists. * Quick column switching view on Item lists. * Supports Column and Line graphs. * Provides Data Backup reminders.